The Election Commission barred Uttar Pradesh Chief Minister Yogi Adityanath from campaigning for 72 hours for his communal remarks. The EC also took action against BSP supremo Mayawati, placing a temporary ban from campaigning for 48 hours. Taking note of a series of violations of model code of conduct, the Election Commission (EC) on Monday, April 15, barred Uttar Pradesh Chief Minister Yogi Adityanath from campaigning for 72 hours for his communal remarks. The EC also took action against BSP supremo Mayawati, placing a temporary ban from campaigning for 48 hours starting tomorrow morning for her provocative speech. This development came hours after the Supreme Court pulled up the poll body for its failure to take action against hate speech during the 2019 Lok Sabha election campaign. "What you are doing," Chief Justice of India Ranjan Gogoi asked the election body, on leaders violating the model code of conduct (MCC) during poll campaigns. While Adityanath was barred over his "Ali and Bajrang Bali" comment made in Meerut rally, the action against Mayawati came for violating the model code of conduct when she asked Muslims at a rally in Saharanpur to vote in a consolidated manner in favour of the SP-BSP-RLD combine. "The Commission, under Article 324 of the Constitution and other powers enabling in this behalf, bars him from holding any public meetings, public processions, public rallies, road shows and interviews, public utterances in media (electronic, print, social media) in connection with ongoing elections for 72 hours from 6 a.m. on April 16 (Tuesday)," the EC statement on Adityanath said. In a separate order, the poll panel censured Mayawati and "strongly condemned the impugned statements made by her". It said she would also be barred from holding any public meetings, processions, rallies, road shows and interviews, a public utterance in media related to elections for 48 hours. "The Commission observes that being a senior leader, Mayawati should have desisted herself in making statements that have the undertone and propensity to polarise the elections, which is not confined to the constituency only where the statement is made, but to the other parts as well, due to fast dissemination of information in the digital age," read the EC order. 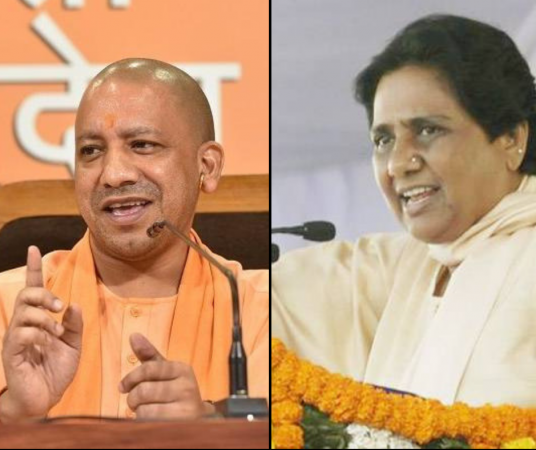 The Election Commission had on April 11 issued notices to both Mayawati and Adityanath for violating the model code of conduct. While the BSP leader had urged the Muslim community to vote only for SP-BSP-RLD alliance candidates, the Chief Minister had said that if the Congress, Samajwadi Party (SP) and Bahujan Samaj Party had faith in Ali (a revered figure in Islam), "we have faith in 'Bajrangbali (the Hindu god Hanuman)'".